Some of you may have noticed the red lump on Aurora’s forehead. At two weeks it started as a little read spot. She is now two months old. I can’t believe it. At Aurora’s doctor visits, they reassured AJ and Katie that this was a common tumor for newborns and that it would eventually go away. Katie did make an appointment with a specialist. They can remove it, but it will leave a cross shaped scar on her forehead. For now, they are going to wait and see what happens. She goes back in a month and they will talk about a topical steroid cream. The hemangioma doesn’t hurt Rori. Only if they get ulcerated do they hurt, but hopefully that won’t happen. 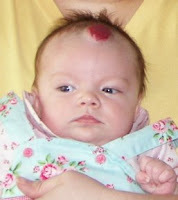 If you’d like to know more about hemangiomas and other vascular birthmarks, go to this website. ~ by mamadubs on June 30, 2007. What ever happened to your daughter? OH… the hemangioma? It is a childhood vascular tumor that just showed up at about 3 weeks of age. She just got it removed. Where did you guys treat hemangioma.. even my girl baby has one right below her eye.